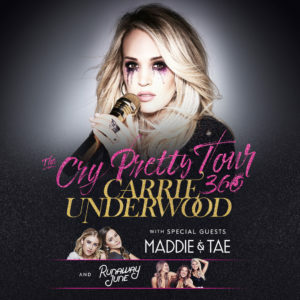 We are happy to announce the Official Carrie Underwood Fan Club Party will take place on Tuesday, June 4th at the Grand Ole Opry in Nashville, TN! Today marks the launch of Year 12 of the Official Carrie Underwood Fan Club! We’ve enjoyed you being a part of the community and we hope that you will come back to join us for the exciting year ahead. Care Bears! We’re excited to share that a limited number of tickets to the filming of CMT Artists of the Year 2018, where Carrie is an honoree and will be performing, will be available exclusively for members of The Official Carrie Underwood Fan Club! Carrie will be performing on Jimmy Kimmel Live! on Wednesday, September 19th. Carrie will be performing on a very special episode of The Tonight Show Starring Jimmy Fallon on Thursday, September 13th. For the first time ever, the show will be broadcast from Central Park! Video Highlights from the 2018 Official Fan Club Party! Check out highlights from this year’s Official Carrie Underwood Fan Club Party! Enter the Carrie-Okie Contest for the chance to sing with Carrie and her band!